ACCENZ – Earthlimited | Earth Limited? From April 2004 to June 2006, Gavin Kenny worked with his artist friend, Fred Robertson, to provide a unique view on adapting to climate change. The focus of the work was to share the wisdom of forward thinking and acting farmers in a creative and informative manner. The result is a weaving together of science, art and good, practical, farmer wisdom. The principal theme that Gavin and Fred explored together is the relationship between macro, meso and micro. The macro climate change picture, the micro farm or individual picture and the meeting place between the two, the meso. The meso relates both to a physical, regional, landscape and the realm of social interaction. The picture we developed and shared was one of building micro and meso resilience. Micro resilience in ourselves, on our farms or our urban home. Meso resilience in our communities and in our wider environment. The publications from this work are freely available to download. If you live in New Zealand and would like a free hard copy please contact Gavin. 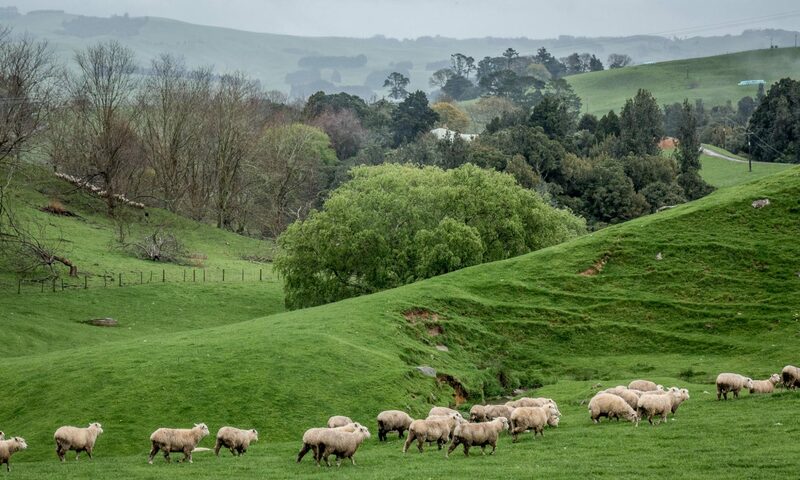 The ‘Adapting to Climate Change in eastern New Zealand’ project was focused on engaging with farmers to draw forward individual stories and their collective thinking and wisdom in relation to climate change. An innovative approach was taken with the work involving active collaboration between a scientist and artist. The principal funder of this work was the Sustainable Farming Fund, with additional financial support from Environment Bay of Plenty, Hawke’s Bay Regional Council, Environment Canterbury, the Climate Change Office/Ministry for the Environment, AGMARDT, Merino NZ Inc.
At the outset it was made clear to us that we needed to be both visual and informative with the information that we presented and that it mattered a lot to share positive stories. Farmers, like many of us in todays world, are busy people and need messages delivered in readily accessible ways. Also, like the majority of us, they hear enough bad news on the TV or read it in the paper. Being positive, proactive, people as a rule they like to hear the positives and if there is a problem they like to know what they can do about it. We may not have succeeded in meeting all of these requirements but we’ve worked pretty hard to make a difficult, and seemingly distant, topic as relevant as possible to what farmers are doing on the land. At the same time we’ve brought forward issues and thinking that is of relevance for communities, rural and urban, throughout New Zealand. New Zealand has it’s own unique history and context, but there is much about this work that is of relevance throughout the world. Good farmers everywhere are very keen observers both of their immediate location and of wider landscapes and issues. In many ways they are a very important voice of the earth. We need to be listening to them and engaging with them as much as we can. New Zealand is a small nation in the south-west of the Pacific Ocean. Our island climate is shaped by large-scale atmospheric processes that are beyond our control. However our activities can determine the degree to which climate impacts on us. Prior to human habitation New Zealand was predominantly covered in forest. Settlement by Maori and subsequently by Europeans resulted in significant deforestation. There have been rapid changes in land use over the last 150 years with both economic benefits and environmental costs. More recently proactive farmers have been working to establish a more balanced approach. It is being recognised by increasing numbers of farmers that smart environmental management has both economic and social benefits. Smart environmental management, with a focus on building resilience, is the key to positive, proactive adaptation. Everyone, both urban and rural dwellers, stands to benefit from such an approach.